The new Soyuz TMA-01M blasts off with a crew of three astronauts from the Baikonur Cosmodrome in Kazakhstan at 7:10 p.m. EDT (2310 GMT) on Oct. 7, 2010. A Soyuzrocket carrying a new crew for the International Space Station got anunexpected sendoff when it blasted off late last night (Oct. 7) in theform ofa farewell appearance from Russian spy Anna Chapman, according to mediareports. 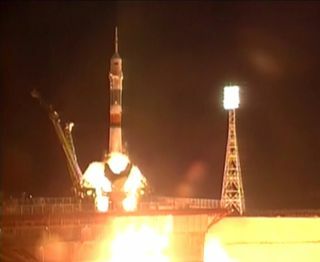 Chapman wassightedby the Associated Press at Baikonur Cosmodrome in Kazakhstan justbefore the7:10 p.m. EDT (2310 GMT) launchof a new Soyuz TMA-01M spacecraft to ferry an Americanastronaut and twocosmonauts to the International Space Station. A photo released by theAP showsthe red-haired Chapman, clad in red jacket and carrying a blue bag. Chapman wasone of 10 Russians arrested for spying in the United States this year.She wasdeported in July during a trade with Russia that returned four menaccused byRussia of spying for the West. The APreported that Chapman did not offer any comments for her appearance attheSoyuz rocket launch other than saying she had "just arrived." She waslater ushered into a guarded guest house after the farewell ceremony,the APreported. The newsservice cited an unnamed source in the Russian Federal Space Agency,whoreportedly said Chapman attended the Soyuzrocket launch to represent a Russian bank. The SoyuzTMA-01M launched American astronaut Scott Kelly and cosmonautsAlexander Kaleriand Oleg Skripochka to the space station. The three men plan to jointhreeother crewmembers already onboard the space station for a five-monthstay onthe orbiting lab. Kelly is aU.S. Navy captain and veteran NASA astronaut who also has an identicaltwin brother ? Mark Kelly ? who is also a Navy captain andastronaut. In aspace first, the two brothers are expected to meet up at the spacestation inFebruary 2011 when their two space missions coincide. Kaleri isRussia's second most-experienced cosmonaut and is making his fifthspaceflightwith the current mission. Skripochka is a test-cosmonaut making hisfirst spaceflight. While therocket lifted off at 7:10 p.m. EDT Thursday night, it was actually 5:10a.m.local time at the Central Asian spaceport. The SoyuzTMA-01M spacecraft is a new model of Russia's long-running Soyuz classspacecapsules. It includes improved guidance, navigation, control, and dataprocessing systems, in addition to an improved cooling device for theelectronics. The Soyuz isdue to dock at the space station tomorrow (Oct. 9) at 8:02 p.m. EDT(0002 GMTSunday).